Yams are members of the flowering plant genus Dioscorea. They are monocots, related to palms, grasses, and orchids. There are about 600 species of yams found around the world, most of them in the tropics. 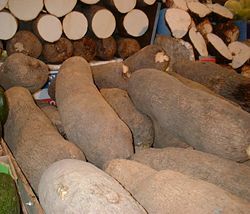 Some species of yam are cultivated for their edible tubers, for medicinal use, and for other uses. Yams remain an important food crop, especially in Africa, and some varieties can be stored for months without refrigeration. In addition to addressing the physical needs of people—offering such nutrition as carbohydrates, protein, phosphorus, and potassium—yams also touch upon the human inner nature, bringing pleasure through their enjoyable taste and texture, and being central to various ceremonies related to their importance in traditional societies of Africa and the Pacific islands. In the United States, sweet potatoes, Ipomoea batatas, are sometimes called "yams," although they are not closely related. Most yam species grow in the tropics and sub-tropics in areas with fairly heavy total annual rainfall, but with a definite dry season. During the rainy season, they produce one or more underground tubers to store food and water through the dry season. The tubers are thickened stems. At the end of the dry season, they send out shoots, which grow into vines that grow up into nearby trees and bushes. Many species grow bulbils, small tuber like growths, at the bases of their leaves. These can fall to the ground and produce new plants. Most yam plants have small flowers with one plant having only male or female flowers (Kay 1987). The tubers of most species of yam are poisonous to humans. A few are edible and some others can be made edible by various methods including soaking, boiling, and drying. People started to cultivate yams, rather than digging up wild ones, as long as 10,000 years ago in both Africa and Asia, and some time later in the New World. The cultivation of most yams is very labor intensive. Cultivated yams generally do not produce seeds and so tubers or pieces of tuber must be planted in prepared soil, most often in mounds, to grow new plants. Some kind of framework or trellis must be provided to support the vines, unless they are grown next to trees or in fields previously planted with corn so that the old stalks can provide support. At the beginning of the dry season, the vines die away and the tubers are ready to be harvested. Most species must be dug out by hand very carefully; if they are damaged they could spoil soon (Kay 1987). In the late 1900s, wars and famines in parts of Africa contributed to the loss of some cultivated yam varieties. Work is now going on to restore them and also to develop new varieties (CGAIR 1994). Yams are a nutritious food, providing carbohydrates, some protein, and minerals like phosphorus and potassium. The tubers of many varieties can be stored as long as six months without refrigeration (CGAIR 2006). For hundreds of years, yams were the most important food in many parts of Africa and the Pacific islands. There are many traditions associated with yams including ceremonies and festivals, which show their importance in traditional society. Today, West Africa produces over 90 percent of the world's yam crop, with Nigeria the largest grower. South America, the West Indies, the Pacific islands, and some parts of Asia also produce yams, though most are grown for local consumption. There is also a small international trade and some are grown for medicinal and other uses (CGAIR 2006). Dioscorea rotunda, the white yam, and D. cayenensis, the yellow yam, are native to Africa. They are the most important cultivated yams. In the past, they were considered two species but most taxonomists now regard them as the same species. There are over 200 cultivated varieties between them. They are large plants; the vines can be as long as 10 to 12 meters (35 to 40 feet). The tubers most often weigh about 2.5 to 5 kg (6 to 12 lbs) each, but can weigh as much as 25 kg (60 lbs). After 7 to 12 months growth the tubers are harvested. 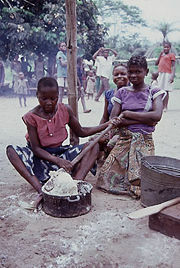 In Africa, most are pounded into a paste to make the traditional dish "fufu" (Kay 1987). A piece of cake made with ube (water yam). Dioscorea alata, called water yam, winged yam, and purple yam, was first cultivated somewhere in Southeast Asia. 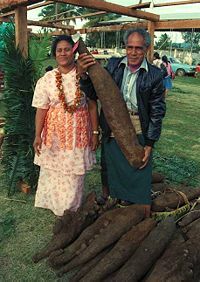 Although it is not grown in the same quantities as the African yams, it has the largest distribution worldwide of any cultivated yam, being grown in Asia, the Pacific islands, Africa, and the West Indies (Mignouna 2003). In the United States, it has become an invasive species in some southern states. In the Philippines, it is known as ube (or ubi) and is used as an ingredient in many sweet desserts. In India, it is known as ratalu or violet yam or the Moraga Surprise. In Hawaii, it is known as uhi. Uhi was brought to Hawaii by the early Polynesian settlers and became a major crop in the 1800s when the tubers were sold to visiting ships as an easily stored food supply for their voyages (White 2003). Dioscorea opposite, Chinese yam, is native to China. It is tolerant to frost and can be grown in much cooler conditions than other yams. It is now grown in China, Korea, and Japan. It was introduced to Europe in the 1800s when the potato crop there was falling victim to disease. It is still grown in France for the Asian food market. The Chinese yam plant is somewhat smaller than the African yam, with the vines about 3 meters (10 feet) long. The tubers are harvested after about 6 months of growth. Some are eaten right after harvesting and some are used as ingredients for other dishes, including noodles, and for traditional medicines (Kay 1987). Dioscorea bulbifera, the air potato, is found in both Africa and Asia with slight differences between those found in the two places. It is a large vine, 6 meters (20 feet) or more in length. It produces tubers; however the bulbils that grow at the base of its ]]leaf|leaves]] are the more important food product. These are about the size of potatoes (hence the name air potato), weighing from 0.5 to 2 kg (1 to 5 lbs). Some varieties can be eaten raw while some require soaking or boiling for detoxification before eating. It is not grown much commercially since the flavor of other yams is preferred by most people. However it is popular in home vegetable gardens because it produces a crop after only 4 months of growth and continues for the life of the vine, as long as two years. Also the bulbils are easy to harvest and cook (Kay 1987). In 1905, the air potato was introduced to Florida in the United States and has since become an invasive species in much of the state. Its rapid growth crowds out native vegetation, and it is very difficult to remove since it can grow back from the tubers and new vines can grow from the bulbils even after being cut down or burned (Schultz 1993). 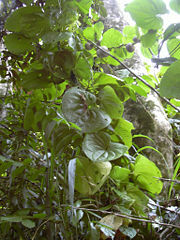 Dioscorea esculenta, the lesser yam, was one of the first yam species cultivated. It is native to Southeast Asia and is the third-most commonly cultivated species there, although it is cultivated very little in other parts of the world. Its vines seldom reach more than 3 meters (10 feet) in length and the tubers are fairly small in most varieties. The tubers are eaten baked, boiled, or fried much like potatoes. Because of the small size of the tubers, mechanical cultivation is possible; which, along with its easy preparation and good flavor, could help the lesser yam become more popular in the future (Kay 1987). Dioscorea trifida, the cush-cush yam, is native to the Guyana region of South America and is the most important cultivated New World yam. Since they originated in tropical rainforest conditions, their growth cycle is less related to seasonal changes than other yams. Because of their relative ease of cultivation and their good flavor they are considered to have a great potential for increased production (Kay 1987). Dioscorea dumetorum, the bitter yam, is popular as a vegetable in parts of West Africa; one reason being that their cultivation requires less labor than other yams. The wild forms are very toxic and are sometimes used to poison animals when mixed with bait. It is said that they have also been used for criminal purposes (Kay 1987). Consultative Group on International Agricultural Research (CGIAR). 1994. A Breakthrough in Yam Breeding. World Bank. Retrieved June 8, 2007. Consultative Group on International Agricultural Research (CGIAR). 2006. Yam. Retrieved June 8, 2007. Kay, D. E. 1987. Root Crops. London: Tropical Development and Research Institute. Mignouna, H. D., M. M. Abang, and R. Asiedu. 2003. Harnessing Modern Biotechnology for Tropical Tuber Crop Improvement: Yam (Dioscorea spp.) Molecular Breeding. African Journal of Biotechnology 2, no. 12 (December): 478–485. Retrieved June 8, 2007. Schultz, G. E. 1993. Element Stewardship Abstract for Dioscorea bulbifera, Air potato. The Nature Conservancy. Retrieved June 8, 2007. White, L. D. 2003. Uhi. In Canoe Plants of Ancient Hawai'i. Retrieved June 8, 2007. This page was last modified on 4 April 2008, at 02:37.